I usually try to keep session beers on tap, but at ~8% ABV I broke that rule when I put on the Bière de Garde I brewed near the start of September. It has been a good complement to the ~4% Bretty Belgian Single, especially since my father and my housemate have been doing their fair share of the heavy lifting. Appearance – Clear chestnut-brown body topped with a dense off-white head. The head slowly trailing sticky lacing behind it down the sides of the glass. Smell – Big toasty malt aromatics (rustic bread) mixed with strong fruity esters. The fruit character is dark enough (almost reminiscent of brandy) to match well with a bigger/darker beer, not nearly as fresh-grape-ish as it was in the lighter beers I've done with the Wyeast Kolsch strain. Maybe a hint of spice from the hops, but not much. Taste – Dry upfront, but with a nice lingering toffee sweetness in the finish. The malt comes through more than the fruit, with complex toasty aromas. It smells like a loaf of bread that has a couple of spots on the bottom that are almost charred. Enough bitterness to balance the slight bit of sweetness, but no more. A bit of warming alcohol in the finish as it comes up to temp. Mouthfeel – Medium body, with a lively carbonation that ensures it isn't too heavy. 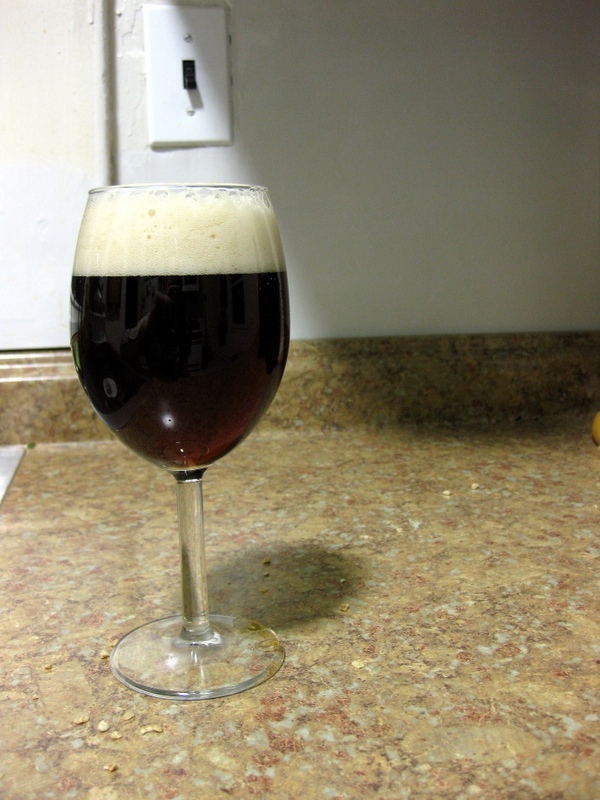 Just about right, but if it was bottle conditioned I might have gone slightly higher on the carbonation. Drinkability & Notes – I think this is a great beer, sort of a French Doppelbock. A bit maltier and sweeter than most of the commercial versions of the style, but nothing objectionable when there is snow on the ground. I was reading through your original recipe post and noticed you mentioned mashing pretty low to dry it out. You mention it coming off on the sweet side in the tasting. Do you think any of the has to do with carmelization from the home-toasted malt, or something else? I haven't messed with toasting my own malt, but that and home-smoking are something I hope to at least dabble with this coming year. Also, if you do this again would you stick with the Kolsch yeast, try another lager strain, or go with an ale strain like the smaller French breweries? I think the sweetness was more of a result from the higher than intended OG. The yeast achieved ~78% attenuation, which is slightly lower than the standard 80-85% for the style, but not by much. To get caramelization from toasting you'd need to soak the malts in water and cook them low so the enzymes start converting the starches into sugars before they are destroyed by the heat. I would guess that the kolsch strain is similar to the ale strains used by some smaller producers since it is relatively clean and Cologne isn't too far from France. I was pretty happy with it, but I’d probably give a slightly elevated lager fermentation another shot (I had good luck with Wyeast 2206 Bavarian Lager ~60 F in the Biere de Garde portion of my Cable Car clone). I keep meaning to try home smoking malt, but haven't gotten around to it yet, next spring/summer. This sounds like it would be well worth checking out. I'm glad I happened upon your site... I am always looking for some great recommendations.